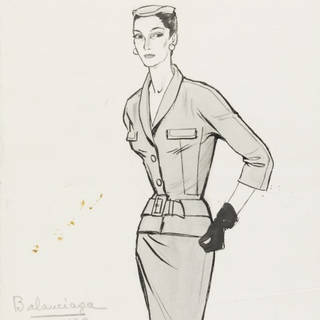 Cristóbal Balenciaga changed the shape of women's fashion, creating sculptural forms that stood away from the body, framing the figure rather than restricting it. Working with students from the London College of Fashion, we've created digital animations to show how three of his iconic designs were constructed, revealing his mastery of pattern cutting, draping and manipulation of fabrics. This dress was dubbed the 'tulip' by the press. A signature for Balenciaga – the plain front reserves interest for the back of the dress, with its large bow reminiscent of Japanese kimono. The 'tulip' dress is made from stiff silk gazar fabric which stands away from the body and provides the strong architectural shape. 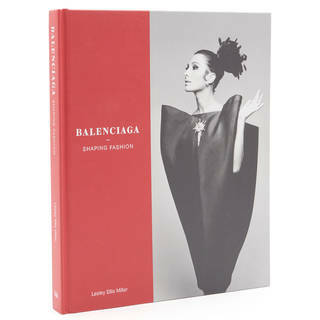 The fabric is joined at the centre front and centre back with no side seams – a signature of Balenciaga's designs. A second panel of fabric hangs from the shoulders and is secured with bar tacks under the arms, creating the illusion of a loose, unstructured garment. This woman's evening cape and dress ensemble typifies the increasing simplicity and abstraction of Balenciaga's later work. 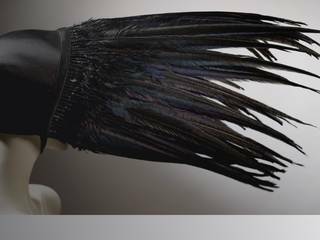 It relies on a deep knowledge of the fabric – which determines the sculptural shape. Although strikingly modern, the design echoes the mantles and cassocks worn by Catholic clergy in Balenciaga's Spanish homeland. A virtuoso example of pattern-cutting, the main body of the dress is cut from a single piece of fabric joined at the centre back. There are no side seams. 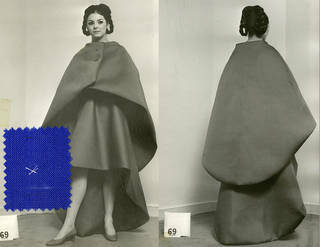 The neck of the cape is painstakingly pieced to ensure a soft line which stands away from the body. Created through skilful draping of the finest silk taffeta, "Almost air-borne" was how Vogue described this historically inspired evening dress. 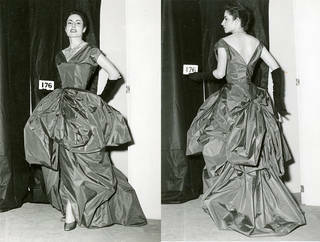 "Taffeta as thin as burned paper, shaped into harem skirts. 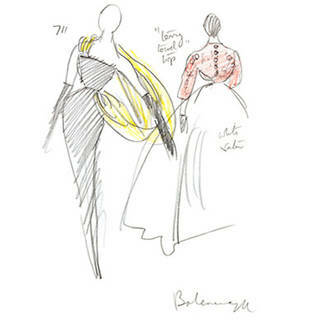 Balenciaga's source: the balloon skirts of the women of Ibiza, who look like clouds walking". Great swathes of fabric, supported by hoops, are drawn towards the back from the centre front seam. The skirts are shaped through 'bagging out', which creates spacious voids which fill with air as the wearer walks. At the hem are ties which knot above the knee, lifting and ballooning the hem for yet more drama.